Things fall apart. It’s one of the only elements we can predict in an often unpredictable world. Try as we might, there are just some things in life that crumble in our hands, or slip away from us…things that we have tried to build, landmarks we try to achieve, relationships we try to maintain. We work, and we labor, and we chart a course only to find ourselves lost amidst a sea of change and, my God, it’s so frustrating. Though, sometimes what we perceive to be falling apart doesn’t frustrate us so much as takes us by surprise. 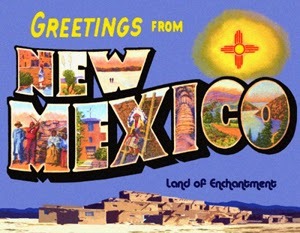 Karen and I were eating with some friends the other night and when we broke the news to them that we were moving to New Mexico, their response was one of both joy and sadness. Joy, that we were answering God’s call on our life. Sadness, that our friendship will be fundamentally changed. I’ve had many of those conversations here as well. “So soon” has been a constant refrain as I’ve been talking to some of you about our new call. Even a good thing like this, the opening up of a new ministry for me, Karen, and Jude, can be both celebrated and experienced as a ‘thing’ falling apart. 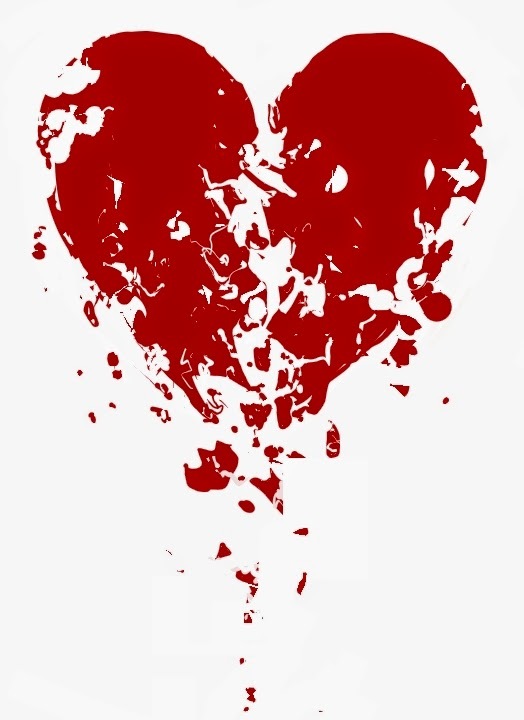 Many of us, though, know all too well the pain of something falling apart that has nothing good at its core. The sudden loss of a job, the busting up of a marriage, the death of a loved one. The list could go on. I imagine that we all can identify things in our life that have fallen apart, where we’ve been left in a rubble heap, trying to figure out just how we were going to move forward. And that time of figuring out is like the worst kind of waiting game we will ever have to play. We crave stability, and we crave normalcy, and when something disrupts the balance, all there is for us to do is wait. Waiting. Along with grace, mercy and love, waiting is a persistent theme running through the Scriptures. Leading up to the Day of Pentecost, the disciples were told to wait. As Luke begins his narration the Acts of the Apostles, he opens with one of Jesus’ post-resurrection appearances: After his suffering he presented himself alive to them by many convincing proofs, appearing to them over the course of forty days and speaking about the kingdom of God. While staying with them, he ordered them not to leave Jerusalem, but to wait there for the promise of the Father. ‘This’, he said, ‘is what you have heard from me; for John baptized with water, but you will be baptized with the Holy Spirit not many days from now’. Just like us and every other human being, the disciples seemed not to enjoy being told to wait, or at least they didn’t quite understand Jesus’ plan: So when they had come together, they asked him, ‘Lord, is this the time when you will restore the kingdom to Israel?’ Then, once more, Jesus instructed them to be patient…to wait, because something was coming: It is not for you to know the times or periods that the Father has set by his own authority. But you will receive power when the Holy Spirit has come upon you. 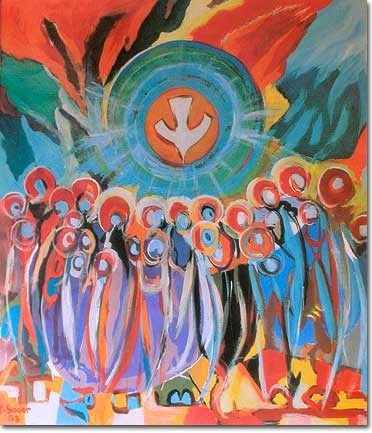 Jesus then ascended into heaven, and the disciples were left on Mount Olivet, staring into the sky until angels appeared to shake them loose from standing there. They returned to Jerusalem and began praying. As Luke says, they were “constantly devoting themselves to prayer.” Their Lord rose from the dead, and rather than living in their midst as in the days of old, he instructed them to wait for what was coming. No promise of when, at least not a promise they could fully understand. And so all there was for them to do was wait and pray. All there was for them to do was wait and pray. That certainly feels like the story of my life, and I imagine it echoes many of your experiences. We wait for things to get better after they’ve fallen apart, like the disciples had to wait after their experience of Jesus had once again fallen apart. He died, returned, and then left again. I can’t imagine they experienced it as anything other than another ‘falling apart.’ But in the midst of the confusion and waiting, their faith remained. They returned to Jerusalem, devoted themselves to prayer, and eventually got on with business we might call ‘church work.’ And though our world seems to always be teetering on the brink of falling apart, we do ‘church work’ too. We gather to worship the King of Glory, sending up prayers, celebrating Eucharist, reading Scriptures…all while waiting in this interim period between the days of Jesus walking on the earth and when he comes again in glory, to judge the living and the dead. Like us, the disciples waited. And prayed. And were gathered once again when, finally, it began. And suddenly from heaven there came a sound like the rush of a violent wind, and it filled the entire house where they were sitting. Divided tongues, as of fire, appeared among them, and a tongue rested on each of them. All of them were filled with the Holy Spirit and began to speak in other languages, as the Spirit gave them ability. All of their confusion about the next steps in their journeys of faith, all of their praying, all of the tedious and trying moments of waiting…it all paid off. With their faithfulness intact, and their commitment to the Risen Lord still alive, they were primed and ready to receive what Jesus had so cryptically promised them those 10 days before. They received the Spirit, and immediately went out of their room, setting the world ablaze with their preaching and teaching. And, as many like to say, the Church was born that day. But to be quite honest, I’m not really interested in remembering that Pentecost is the birthday of the Church. I’m much more interested in discerning what the living and active Spirit of God is doing in our midst, in our communities, in our world today. And so, I find myself claiming for myself what Jesus said in the Gospel today: I still have many things to say to you, but you cannot bear them now. When the Spirit of truth comes, he will guide you into all the truth; for he will not speak on his own, but will speak whatever he hears, and he will declare to you the things that are to come. 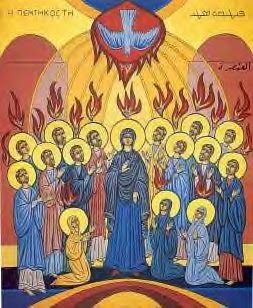 It does me little good to remember and celebrate that nearly 2,000 years ago the Spirit descended like tongues of fire on disciples who are long dead. The real question, for me at least, is “Am I listening to what the Spirit is declaring to me now?” Am I remaining faithful to the Risen Lord in my own periods of waiting, in those moments things seem to be falling apart, in those moments where God seems to be more silent than speaking? Those questions have certainly been live for me as I’ve been discerning this new call on my life. And they’re live questions for this community here. Part of the difficulty of leaving this church, a place I love, is that I won’t be present with you all as you have your own ‘Pentecostal’ moments. I won’t see the fruition of the work God has been doing, and will continue to do, in your midst. If there is any worth in keeping this day as a liturgical feast, with the rich Scriptures we have heard, is that we are reminded that the Spirit of God, the living presence of Jesus, has always led, and will always be leading us into something new, even if we can’t fully grasp what it is. As St. Paul has said, Likewise the Spirit helps us in our weakness; for we do not know how to pray as we ought, but that very Spirit intercedes with sighs too deep for words. And God, who searches the heart, knows what is the mind of the Spirit, because the Spirit intercedes for the saints according to the will of God. We remember not that the Church was born, but that the Church is still alive, and even if our lives as individuals feel shaky, or as a community we can’t grasp the fullness of what God is doing, we remain faithful. We wait, and we pray, with the conviction that tongues of fire will one day rest on all of us. First Baptist Church, where I once served, has a curious custom. After the reading of the Scripture, the pastor will say, “This is the Word of God.” And the people respond, “And it is for us.” If there is any day to claim such a thing, it is today. This story, of a Spirit-inspired revival, is the Word of God. And it is for us. *A sermon preached at St. Andrew's On-the-Sound Episcopal Church in Wilmington, NC on May 24, 2015, Pentecost. The texts were Acts 2:1-21, Romans 8:22-27, and John 15:26-27; 16:4b-15.